Book News: New Toni Morrison Novel Slated For An April Release : The Two-Way The novel, Morrison's 11th, will be titled God Help the Child. J.K. Also: Rowling has plans for a new book of her own. And a book has been returned to a Washington state library — 65 years overdue. Toni Morrison has been busy this fall, first announcing her plans to keep her archives at Princeton and then sparring amiably with Stephen Colbert. With a book coming out in spring 2015, she appears intent on keeping up the pace. 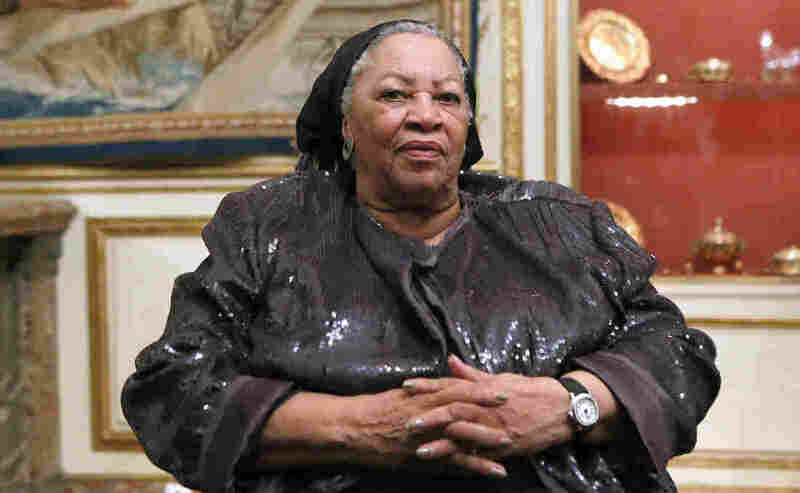 In some six months, a new novel by Toni Morrison will begin nestling its way into bookshelves. The Nobel laureate (and Pulitzer Prize winner, and Presidential Medal of Freedom recipient and, well, you get the idea) will publish her 11th novel, God Help the Child, in April 2015. According to press materials from Morrison's publisher, the book will feature a beautiful woman who goes by the name Bride, and "whose stunning blue-black skin is only one element of her beauty, her boldness and confidence, her success in life; but which caused her light-skinned mother to deny her even the simplest forms of love until she told a lie that ruined the life of an innocent woman, a lie whose reverberations refuse to diminish." Beyond Bride, the book doesn't lack for names just as weighty — there's Booker, the man Bride loves and loses; Rain, the white child who befriends Bride; and Sweetness, Bride's mother. But six months can be an awfully long wait. Meanwhile, you can kill time by watching Toni Morrison's 2004 commencement speech to Wellesley College, which was picked by NPR earlier this year as one of The Best Commencement Speeches, Ever. Speaking of commencement speeches ... J.K. Rowling plans to publish hers. In her 2008 commencement address to Harvard University, Rowling extoled the virtues of allowing oneself to fail, and of committing oneself to the opportunities born of imagination. "We do not need magic to change the world," she told the assembled graduates. "We carry all the power we need inside ourselves already: we have the power to imagine better." Now, publisher Little, Brown and Company has announced plans to release that speech as a book titled Very Good Lives: The Fringe Benefits of Failure and the Importance of Imagination. Joel Holland will illustrate the edition, and its release date, coincidentally, is slated for April of next year, too. The lion's share of proceeds from the book will go to Lumos, Rowling's charity to support disadvantaged children. Zoella Starts Fast: From two titans of the literary world to a notable rookie: Zoe Sugg has broken the record for first-week sales of a debut author in the U.K., according to The Telegraph, moving more than 78,000 copies of her novel, Girl Online. According to the paper, the book is the fastest-selling debut since Nielsen BookScan started compiling such statistics in 1998. Sugg, a vlogger better known by her YouTube moniker, Zoella, beat out E.L. James, Dan Brown and, yes, Rowling herself — all of whom had slow openings to what would become massively popular debuts of their own. And of course, Sugg's book already has a sequel in the works. Expect it next year. Returned — Library Book Overdue By 65 Years: The Associated Press reports that a copy of Gone with the Wind, last checked out from a Washington state high school library on Jan. 4, 1949, has finally been returned. It didn't turn up until about a month ago, when the school received a letter from someone in Maine asking a simple but odd question: Did the school exist back in 1949? "I'd be willing to ship the book back if this is the same school," said the letter writer, Wayne Hachey. "As long as I don't have to pay the late fee in back of the book at 2 cents per day. That would be around $470."